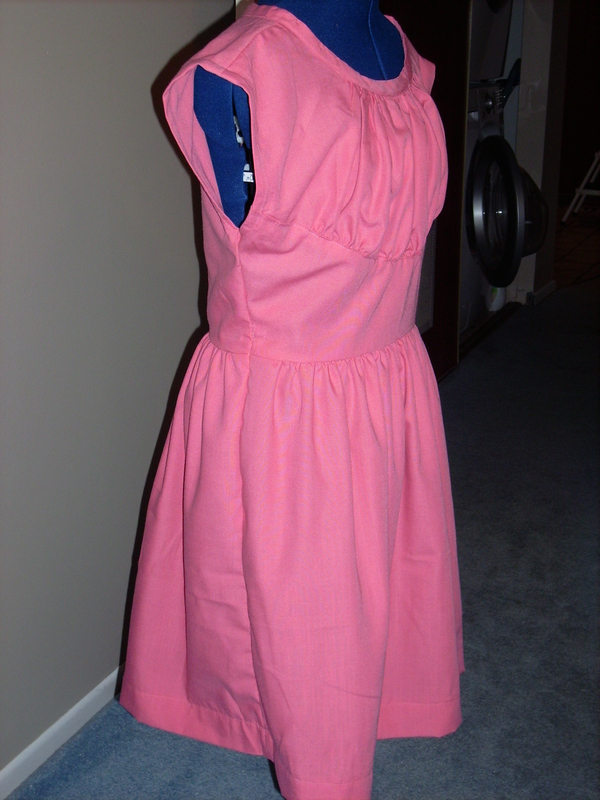 This is the first Burda Style pattern that I have ever tried to do. The pattern pages in the magazine put me off of trying them out last year. But the post on Pattern Review message boards really helped make sense of the craziness on the page. One thing to remember- add your seam allowances! I forgot to add that to the tracing paper pattern piece for the front, but at least I realized it before cutting. At least I was able to add something on during that for the front piece. I did remember to add the seam allowance to the back pattern piece I traced before cutting out my paper pattern. 50% probably isn’t bad for first try with the Burda Style magazine. The pattern goes together pretty easily. There are no darts in it. I used a 36 for the bust area and graded out to a 40 for the hips. I don’t seem to have as much blousyness as mentioned by others on pattern review website. But I do have a gaping problem at the keyhole- but at least the tie does sort of cover that up. I also used a rayon challis as my fabric choice so that may have something to do with that but I am not sure. 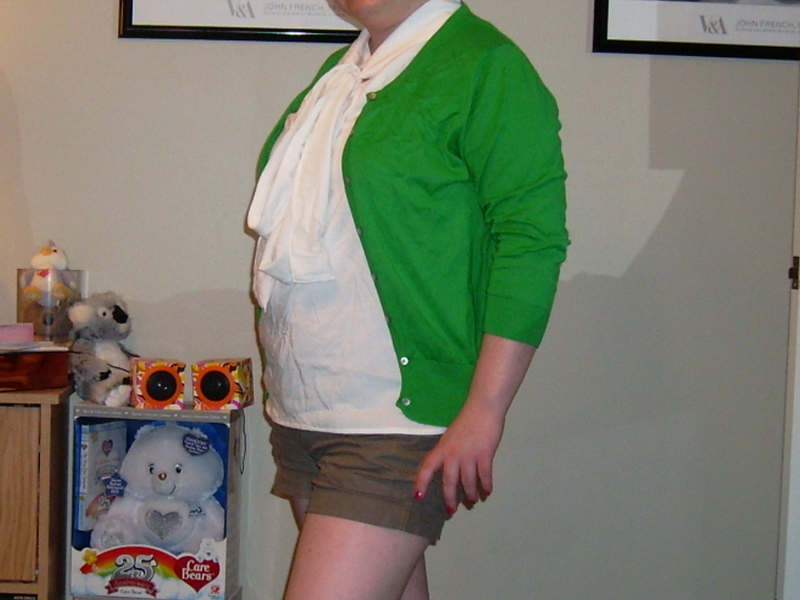 I wanted a nice easy neutral summer sleeveless blouse which could be worn to work with a cardigan. I may have to go change out the button to a larger one that has more substance. My button sort of looks out of place. I didn’t want a thick tie so may tie pieces are about 6 inches wide total (so 3 inch folded over). I didn’t interface the tie at all- I picked the rayon challis for its light flowyness so I wanted the tie to be similar. The length of the tie does weight it down a bit. I think the pattern is a keeper. However before making another one I have 2 more tie collar blouse patterns to try out Simplicity 2154 and Colette Patterns Jasmine. It looks like I am advancing in sewing skill level (maybe)? Vogue rates 8728 at an average and I didn’t have too much difficulties with it. The seam finishes may not be the best. They are nice but I probably should have used flat felled or something else. I had to redo the zipper. I tried using the sewing machine to put it in and it looks horrible. I am definitely better at hand picking zippers. Tailor tacking is getting better. If I make it again, I really need to add an extra inch or so to the waist. I used half inch seams for the sides. My goodness that puppy is tight. I cut a size 14 all over. It worked well in the bust and hips- not the waist. Adding extra to the waist may cause one to lose some of the gathers in the bust and skirt. For the skirt that is alright. I am not so sure about the bust area losing gathers. Since I am petite, I had to take about 4 inches off the hem of the skirt. 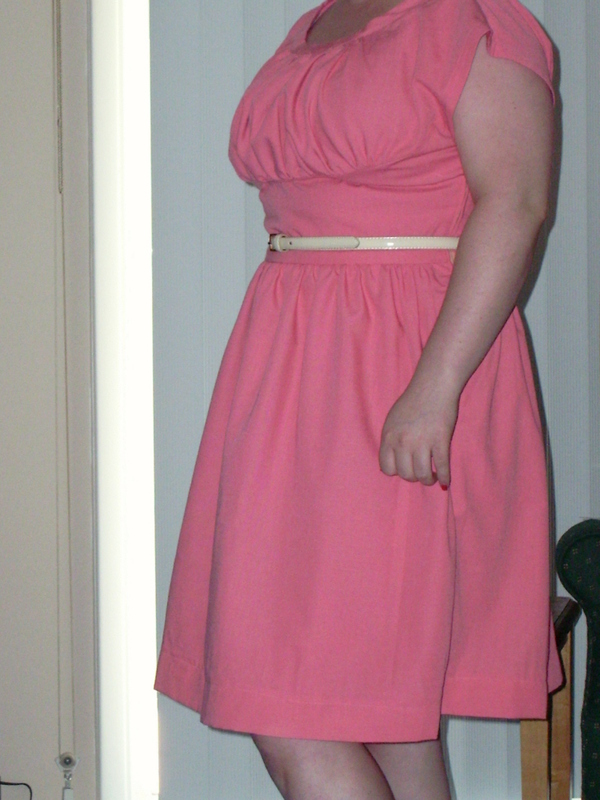 I used a 3 inch hem instead of a 2 inch hem so that I would have a knee length dress. I used a rayon/ poly blend that had a linen look to it. The texture doesn’t take away from the pattern. 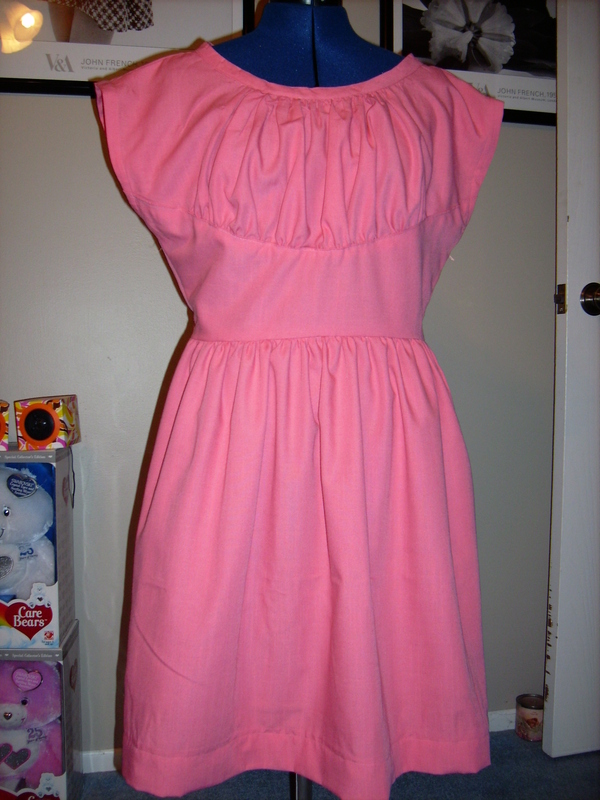 It is the same type of fabric I had used for my 1964 Simplicity 5267 except that it is in more of a peachy coral color. I am not exactly in love with the dress but I do like it.